Il campeggio Camping Erlebnis Zugspitze GmbH è dotato di 120 piazzole itineranti e di 40 piazzole stanziali. In bassa stagione, nel periodo 07-01-2019 - 28-02-2019, 11-03-2019 - 11-04-2019, 29-04-2019 - 07-06-2019, 24-06-2019 - 27-06-2019, 09-09-2019 - 24-10-2019 e 04-11-2019 - 19-12-2019, è possibile soggiornare a soli €20,- a notte in una delle 120 piazzole itineranti del Camping Erlebnis Zugspitze GmbH di Grainau (Baviera). Oltre ad offrire prezzi vantaggiosi ai titolari della CampingCard ACSI, il campeggio accetta anche l'ACSI Club ID (sostitutivo del documento di identità). Campeggio fra una strada di transito e lungo un piccolo fiume, circondato da alberature decidue e conifere, con vista su alte montagne (Zugspitze). Arrived and were greeted warmly and checked in quickly. We arrived during the Whitsun holiday weekend and during a heatwave so we're pleased that our pitch had a tree for shade. This is not a typical site as there is not much grass. It is mainly stony and to be honest the motorhome placements looked more like a carpark. Caravan pitches were much nicer. That being said the views from the site are magnificent, waking up and looking out at Zugspitze is not something you will ever forget. We spent 5 days here but there is so much to do if you like walking, cycling, canoeing. It's also well located for day trips to Schloss Linderhof, Fussen, in to Austria. Garmish is a really pleasant town. Recommended. Mostly gravel pitches, reasonable size. Larger motorhomes are put on a communal parking area. Very good toilet / shower block, as with other sites that cater for the winter ski season. You are given a free bus pass which can be used on regular buses between Garmische- Partenkirchen and Lake Eibsee. Visit to Eibsee recommended, beautiful walk around lake. You can also take the train/cable car to the top of Zugspitze, quite pricey but no doubt fine views on a clear day. A beautiful location definitely 10/10 for the views. We stayed in Sept & the campsite was still quite busy so in the summer I'm sure it would feel like you were quite hemmed in! However pitches are huge, flat & really good. Shower blocks despite being s little older were really clean & well looked afterwards. No time limit on showers. Great access to Zugspitze & the campsite offer free bus passes. There is an Aldi directly opposite the campsite. Staff at reception friendly & welcoming & spoke really good English. Location stunning honestly takes your breath away! We stayed here in June 2016 with our campervan van. The pitches are well marked out. The sanitation block is fine. The views from all the pitches are stunning. We cycled into Garmisch-Partenkirchen and also to Eibsee but buses run from outside the campsite in both directions. Shopping directly across the busy road. We did not get disturbed from the road noise but parked well back. The staff are very helpful. We would definitely recommend this site and return. There are restaurants across the road. Spent 3 nights there in a tent. Surprisingly good sleep despite the closeness of the main road. Also, almost the only camping during this years´ holiday that had appropriate, functional but non-disturbing night lights (most of the others had too much light in the night). However, the hygiene area looks, feels and smells decidedly un-hygienic (obvious mold on the mortar between tiles on shower cubicle walls, apparently too few toilet cubicles for the amount of people, overflowing rubish bins). This place is great as a base for hiking trips, while spending as little waking time at the campsite as possible. The closeness to bus stop with free bus pass, and to the shops, is a good thing. However, there is a lot of car and lorry traffic and no safe pedestrian crossing over the very busy road towards the shops, the stop towards Ga-Pa and the pub - maybe the owners should try to persuade the authorities to establish one? Volete prenotare il Camping Erlebnis Zugspitze GmbH o oppure saperne di più? Potete farlo usando i seguenti dati. Da München dir. Garmisch-Partenkirchen fino per A95 Eschenlohe. Via B2 e B23 per Garmisch-P. B23 Fernpass/Ehrwald. Camping sul fiume. O via A7 Ulm, Kempten e Füssen, oltre Reutte. Poi per Garmisch-P. per B23. 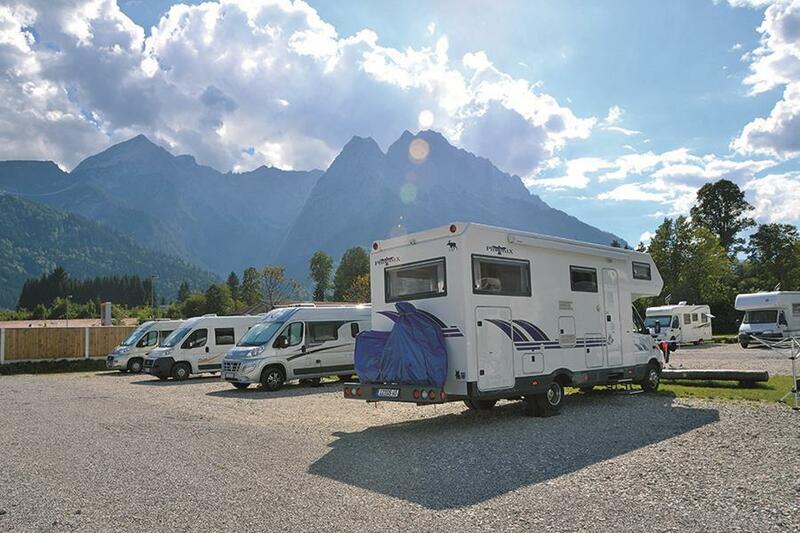 CampingCard ACSI invia la tua richiesta di informazioni al "Camping Erlebnis Zugspitze GmbH".